An excellent valve stem packing for use in high temperature and pressure steam service. The construction features an outer jacket of wire-reinforced carbon yarn over an improved core, allowing increased service life. 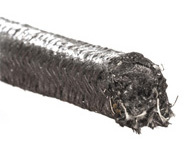 The unique construction of the outer jacket encapsulates the Inconel™ alloy wire reinforcement in the carbon yarn. There is no wire in contact with the stem; therefore, stem wear is virtually nonexistent. Inconel™ – Inco Alloys International, Inc.